← Francis Chan: Was It Truly Division or Simply a Lack of Belief? 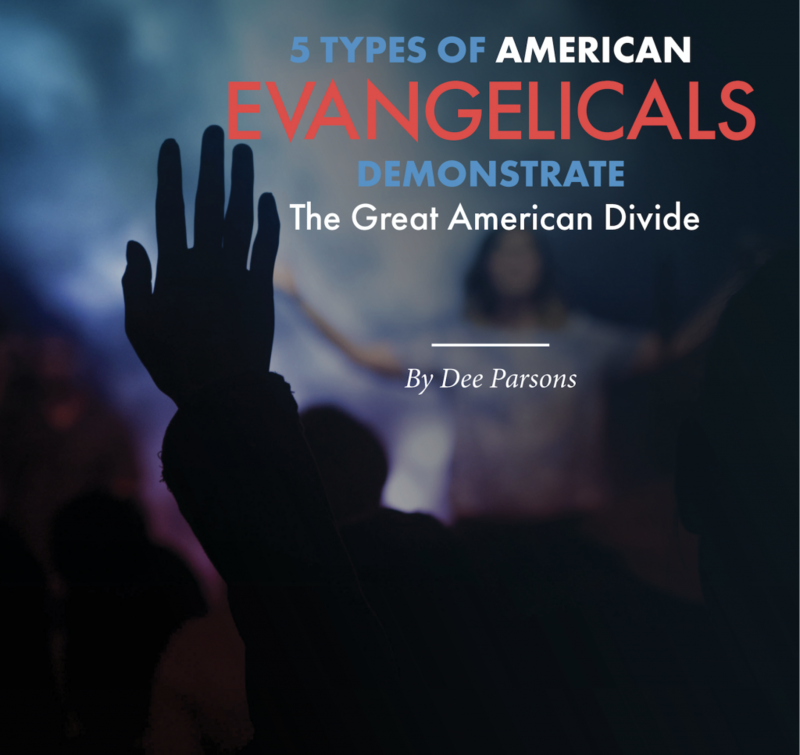 The Christian Post featured 5 types of American evangelicals; new report contributes to ‘what is evangelicalism?’ debate.This article was based on a report of the Center for Religion and Civic Culture: The Varieties of American Evangelicalism. The report identifies the differences between these groups. The key to this demographic is political power: access to it, holding it, excluding other groups from it and using it to advance a conservative, nationalistic vision of evangelical Christianity, particularly around abortion and “religious freedom. Trump is often referred to as Cyrus, the Persian king who freed the Israelites from their captivity in Babylon and enabled the rebuilding of the Temple in Jerusalem. The fact that Trump is the 45th president, and Cyrus’ actions are recounted in Isaiah, chapter 45, is seen as having prophetic significance. Like Cyrus, Trump is an ungodly ruler who is nonetheless guided by the hand of God to bring biblical prophecy into reality. Neo-fundamentalists are evangelicals who are no less theologically and politically conservative than Trump-vangelicals, but who maintain a purist approach to theology and morality that determines which people or groups they will cooperate with to achieve their aims. seek to maintain the most restrictive forms of relationships, not only with other Christians but also with the leaders of other religious, social and political groups. Further, they tend to focus less on mobilizing for political ends than preaching a pure and unadulterated form of Christian belief and morals. Neo-fundamentalists claim authority as morally and religiously “pure” Christians and make their views known through and within their institutions. For instance, the students at Liberty University sought to distance themselves from Trump as a moral representative, but not from his domestic policies and global political perspective. iVangelicals are concentrated in the evangelical megachurch movement and focus on reaching large numbers of people through popular worship services, a wide range of programs and small group ministries. Congregations of Kingdom Christians strive to mirror the demographic and socioeconomic mix of the urban neighborhoods where they are rooted. They often include a more diverse mix of Asian, Latino and Black members than other evangelical institutions, where ethnic diversity is largely aspirational and whites compose majorities and hold the organizational power. often critique the economic and political systems that produce poverty and racial injustice, the focus of their efforts is on creating relationships in the local community and shaping policy through engagement with local officials. The ethos of Kingdom Christians thus reflects an inclusive form of Kingdom Theology that is marked by a keenly localized concern for human flourishing and the systemic sources of suffering. The Peace and Justice wing of evangelicalism is a loose network of evangelical pastors, non-profit leaders, professors and activists. The above Christian Post article discusses the evangelical effort to define itself. -The Bible is the highest authority for what I believe. -It is very important for me personally to encourage non-Christians to trust Jesus Christ as their Savior. -Jesus Christ’s death on the cross is the only sacrifice that could remove the penalty of my sin. -Only those who trust in Jesus Christ alone as their Savior receive God’s free gift of eternal salvation. It is my observation that there is an increasing divide between groups of Christian believers based on voting record or political persuasion. Add to this the increasing division between Calvinists and all other evangelicals and there is trouble brewing. Christ said we were to be know by our love for one another. Today’s confused evangelicals/Christians appear to claim that they will know we are *really* Christian by our voting record. I’m evangelical but not one of those 5. Just your middle of the road to conservative non fundamentalist born again believer, non young earth type. Are there any others like me out there or have we vanished? More seriously than my prior remark, ideas tend to ramify and “speciate” over time, and groups that take ideas seriously — as the churches historically have — inevitably tend to drawn apart by this process. I used to be a combination of 2 and 5 (with strong sympathies for 4.) Any more, I suspect that that there are significant conceptual flaws in the foundations of evangelical self-conception (or the bits of common self-conception that remain). Maybe we need another category called the “John 3:16 Evangelicals” who also adhere to the four basic truths but are not political in any way. But I suspect there aren’t any big names to attach to this category? I do not fit into any of the five categories. I am guessing folk in these five categories would probably not consider me a Christian. This isn’t a contribution to any discussion as such; it’s more a hello-world sort of comment. I can imagine a context in which someone might not mean it as an insult, but in general I would consider it insulting to be labelled as “evangelical”. Even here in Blighty, where the label is nothing like as strongly party-politically loaded, I’m not evangelical. First and foremost, I’m an agnostic. At the point where it really matters, I don’t know. I know what I think about Jesus, at least insofar as the gospel accounts describe him:- if he is God, then God is worth seeking, at any price. But I don’t know what (if anything) he thinks about me, what relationship I have with him, whether he has any beliefs/desires/intentions regarding me and my life, and if he does, whether I meet them or how I would do so. I take the bible seriously. I believe it has a unique place as a collection of voices seeking God. And insofar as it points to Jesus, God become human, I believe it is a unique signpost pointing towards him. But I do not believe that the bible is God made Book, or that it is greater than God is, or that it is to be worshipped as God. Thus, as evangelicals would see it, I have a “low view of scripture”, and am a heretic. I would be gravely concerned if I ever did anything to suggest to an evangelical that they should regard me as otherwise. I believe the heavy metal genre has produced great as well as terrible music (like every other genre apart from country and western, which has only produced United Breaks Guitars and terrible music). I believe The Life of Brian is a masterpiece of cinematic comedy. I believe the earth is billions, not thousands, of years old, and is spherical, not a disc. I believe that if Jesus rose from the dead then his followers can – in principle at least – heal the sick like he did, and because he did. I believe that if God inspired the bible, then he still speaks directly today. I believe in gay marriage. I am neither “Pro-Life” nor “Pro-Choice” but pro-complexity: it is just not that simple. I could go on, but it’s late. 1) Group #4 examples: Kevin Haah, Rev Lee de Leon, Alongsiders Church are all West Coast. Well, yes, at one level that’s true. But how can you say you love someone, but at the same time allow them to go to hell for all eternity because they believe in soul sleep / a young earth / infant baptism / re-baptism of people who were baptised as bairns / post-millennialism / amillennialism / blah / blah blah / blah blah? This article confirms to me that I’m glad not to be an Evangelical. I left that camp a while ago and I don’t look back. Same here except I am young earth. Those would be the I John 3:16 evangelicals. And I think (or at least hope) they are not few. Nick Bulbeck: Well, yes, at one level that’s true. But how can you say you love someone, but at the same time allow them to go to hell for all eternity because they believe in soul sleep / a young earth / infant baptism / re-baptism of people who were baptised as bairns / post-millennialism / amillennialism / blah / blah blah / blah blah? This, of course, brings into view my worry about the conceptual underpinnings of Ev self-conception. The “gospel” understood as the counterpoint to the “bad news” that (as NT Wright has put it) God so hates the world that He killed His son. In the NAE statement, replace “eternal salvation” with anastasis and zoe aionios and there may be something to discuss (including what those terms mean). I was young and now am old. I have been a believer for 60+ years. No one has ever successfully wrestled me to the ground and put a brand on me. I made a decision long ago to follow Jesus and be a disciple of His. I won’t look back, let up, slow down, back away, or be still. I won’t give up or shut up until I have prayed up and raised up His Name above all names. I will go until He comes for me and go until He stops me. I don’t know where that puts me in the “5 Types of American Evangelicals”, but I do know that the noise in all of those ranks have divided me out of the equation often. I used to think that I was alone in the wilderness, but found that there are 7,000 other Wartburgers who have not bowed to Baal. Maybe we are the 6th group?! Roebuck, I am close … real close. After spending 70 years in Southern Baptist ranks, I was taught that drinking alcohol was a bad thing since it led to dancing. But, this mess in the American church is about to cause me to tip a bottle. Max: But, this mess in the American church is about to cause me to tip a bottle. Or, as my dear wife said just now, we could vape since the Bible says that life is but a vapor. Intersectional Religion & Politics @ Wartburg? Max: I used to think that I was alone in the wilderness, but found that there are 7,000 other Wartburgers who have not bowed to Baal. Maybe we are the 6th group?! Crivens, no – 6th group of what!? We are Wartburg. Hmmm … I might identify with certain aspects of all these. Would that make me a 5-Point Evangelical? I might have a heart attack if someone comes up with ANOTHER 5 point protestant theology!! I think there are some groups which are a mix. Especially #1 and #3 could describe the two major megachurches in DFW (Prestonwood and Gateway; the latter definitely has more #3 in the mix as its elder board is self-perpetuating, whereas Prestonwood allows the congregation to nominate deacons). I am getting older, and now I mostly enjoy at home, unless someone else is driving. My eyes are affected by a medical situation such that I just can’t drive after dark. That and a beer really messes things up – I have to shut one eye just to see double! But I do like to have me a couple of beers of a Friday evening… cheers! I don’t get peoples’ love affair with labels. What happens when you find that your label affirms something you do not? Do you have to go out and find a new label? And so on? If I ever go to a church again, it will be one that does not dictate its members beliefs. No insistence on affirming the Trinity, Inerrancy, etc. These are all man-made theories. They may be true, somewhat true or totally wrong. Why do people insist that everyone must think exactly like them? Sheesh, I would have to ‘discipline’ or excommunicate myself every few months, as my views adapt and change as I study and open my mind more. Sorry, y’all can keep your labels – I signed up for the ‘renewing your mind’ plan. Not related to this post but certainly of interest to all concerned with spiritual abuse, the harvest bible chapel XLT elders prove they aren’t even remotely serious about repentance by firing TODAY the pastor of Naples Harvest Bible Chapel. And all will go for each others’ throats as soon as there are no outside enemies, like the Dukes of Hell over Satan’s empty Throne. THAT is what Real True Christianity(TM) has become. Fisher: Not related to this post but certainly of interest to all concerned with spiritual abuse, the harvest bible chapel XLT elders prove they aren’t even remotely serious about repentance by firing TODAY the pastor of Naples Harvest Bible Chapel. Been following that over at Eagle’s blog. Lead Pastor JMac is bugging out (as Cee Jay and Marky-Mark did in their day), and the existing pastor keeping his Florida bolthole/Fuehrebunker open has outlived his usefulness. Whatever happened to, “Christian?” It has a very nice ring to it…with “Christ” being in it and all. He is still the main thing about Christianity, isn’t He? Because there can be Only One One True Way. Even if it results in the theoretical End State reached by A.W.Pink, The One True Church of One. Note in particular the comment (audiofile) of “Mancow tells MacDonald to Man-up” in the comments section. roebuck: But I do like to have me a couple of beers of a Friday evening… cheers! And a (belated) slàinte mhath to you too! AWWBA, I’ve supported Liverpool Fitba’ Club for over 40 years the noo. However, I am a long way behind Bernard Sheridan, who celebrates his 104th birthday today and has supported them for 96 years. Mr Sheridan will be a VIP guest at today’s home match against Palace. I hope we win, for his sake! Mind you, he’s supported them through thick and thin for nearly a century, so I think he’ll be able to handle whatever happens. augustine: Whatever happened to, “Christian?” It has a very nice ring to it…with “Christ” being in it and all. He is still the main thing about Christianity, isn’t He? It seems that the institutional church in many places has become more of a gathering of “ists” rather than “ians” … fundamental’ists’, Calvin’ists’, Bapt’ists’, Method’ists’, etc. We cling to doctrinal armor, diluting Truth to suit our fancy. I guess “Churchianity” would be a better descriptor of much of the American church. I can take you to churches in my area tomorrow where Jesus’ name will only receive incidental mention … the main thing is not the Main Thing. seems to me that the word “evangelical” is a misnomer in the first place, and it is NOT as it just describes American forms of Christianity. Ideally the word Christian should refer to the same set of beliefs all over the world. Here in America we just mess it up with our various “isms” due to the freedom that we have. In many parts of the world Christian = death sentence. Ask THOSE believers what it means! I think they know better than us!!! Abigail: I think they know better than us!!! Agreed. Pure Christianity can be found where Christians are persecuted. The American church has a lot of impurities in it. In our comfort, we can make it what we want it to be. The God of Entertainment is on the throne in much of the American church … persecuted Christians in other parts of the world would not recognize it as something to give their lives for. Once you see it, you can’t un-see it. Once it’s in your knower, you can’t un-know it. In further other news, I finally gave in to the pestering App Store message and upgraded my MacBook to the Mo Harvey operating system version. Seems to be working so far. I suspect I might count myself among those who punctuate comments on Twitter with #exvangelical. I used to say I was a Christian, but now “christian” is a terrible word to me, synonymous with “smug, loveless hypocrite”. Apologies to sincere followers of Christ who read this. Not talking about you, but about the “christians” we once tried to be part of who tied heavy burdens on each other’s backs and were more into separation and superiority of doctrine than love and compassion and bearing one another’s burdens. Abigail: Ideally the word Christian should refer to the same set of beliefs all over the world. Here in America we just mess it up with our various “isms” due to the freedom that we have. In many parts of the world Christian = death sentence. Ask THOSE believers what it means! I think they know better than us!!! Persecution does strip faith down to the essentials, but at what cost? It hampers the spreading of the Gospel. Church authorities in the Third Reich and Soviet Union faced choices about whether to stay with a hopelessly compromised church, insist on Truth and face arrest, or abandon the church. American Christianity can be shallow, but I can seek a deeper church. I’m allowed to read, and to buy any edition of the Bible. I’m sure you’re not suggesting we give up our religious freedom, but what should we do? Incredible! 7 goals in a Premier League game. That means there will be two 0-0 draws and a 1-0 result soon to balance that out to the 2.81 goals per game average. We need an awakening of great proportions. I don’t fit into any of the 5, and I’ve attended a evangelical churches 61 years. I may need to go ahead and make the switch to a Mainline church. I already vary between Lutheran, Methodist, Episcopal, churches now when I go…. I think we all need to keep in mind that the 5 categories is only the University of Southern California’s attempt to politically group evangelicals. As in any attempt to categorize people, there will be discrepancies. The term “evangelical” is defined today in such a way to render it meaningless. It appears to me that evangelical is used as a pejorative by outsiders most of the time. I try not to use the term, unless my audience holds a preconceived notion of lack of intelligence of the evangelical, so I can hopefully prove that we are not all dumb. These days, I don’t hold much stock categories of people. I’m not an evangelical for a lot of reasons, though I might be okay with confessional Protestant. I find placing people in buckets to be a little bit unhelpful. I’ve known evangelicals that fall into some of the buckets but also none of the buckets. A church, pastor, movement or denomination should be judged by its activities and actions. Christianity falls under such a wide spectrum I’ve seen Catholics and other protestants fall in these categories…yep even Lutherans. Certainly there are church trends that are disturbing and they are rightly brought forward. Maybe I need to read the post again but this one kind of missed the mark. Not sure I get the point. And full disclosure… I don’t identify as Christian. (1) Ephesus (2:1-7): lost its first love. (3) Pergamum (2:12-17): needing repentance. (4) Thyatira (2:18-29): harboring false prophets. (6) Philadelphia (3:7-13): stable, abiding. (7) Laodicea (3:14-22): tepid faith. [ ] As The Wartburg Watch blog has consistently identified since 2009, no 501c3 church establishment, regardless of category, is ‘safe’ from the possibility of some form of church violence. To this day, its pages are replete with glaring gut wrenching ‘real life’ examples. A proverbial pretentious problematic situation has been clearly identified. Q. An acceptable solution is close behind? That sums it up with #’s 1, 3, 4, 5 & 7. Yet the second and sixth seem to be the exceptions: suffering, and abiding. (However, not a theologian here.) In any case, God seems to have His categories, too. Contrary to certain established critic beliefs, this blog does not foster hopelessness, but acute awareness. Hopelessness is an acute blinding victimized spiritual illness. Some of the commentators here unfortunately possibly have contracted it in varying degrees through 501c3 victimization. It is profoundly curable by trusting Jesus at His word. Yet, with all the damage caused, that is easier said than done. An infusion of God’s word will certainly aid in recovery. Hope in His word today, you’ll be glad you did! Right. So, really, our concept of the love God has becomes the kind of love we have towards others. I sometimes wonder: If God is truly kind, forgiving, accepting, and valuing of individuals, how would it feel to stand before him having imagined him as harsh, brutal, demanding and punitive? If the opposite is true, will he be insulted if we thought of him as too kind? Max: I was young and now am old. I have been a believer for 60+ years. No one has ever successfully wrestled me to the ground and put a brand on me. I made a decision long ago to follow Jesus and be a disciple of His. I won’t look back, let up, slow down, back away, or be still. I won’t give up or shut up until I have prayed up and raised up His Name above all names. I will go until He comes for me and go until He stops me. I don’t know where that puts me in the “5 Types of American Evangelicals”, but I do know that the noise in all of those ranks have divided me out of the equation often. I used to think that I was alone in the wilderness, but found that there are 7,000 other Wartburgers who have not bowed to Baal. Maybe we are the 6th group?! Maybe it turns out there is a current beneath the visible surface of believers just living their lives who aren’t connected to or identified by any big name, who are unknown to everyone except God and those people in their circles. And maybe it turns out that the big names and organizations turn out to be nothing and vanish like the wind when their time is up. And truly they had their reward. Wartburgers may well be aware that there is a lunar eclipse coming up in just under 24 hours at the time of writing. It will be visible from much of the earth’s surface, including – for instance – the Americas and Europe. Lunar eclipses are in many ways easier to watch than solar ones – totality lasts for much longer and there is no risk of damaging your eyes. On the other hand, they usually involve staying up late or getting up early! Totality is around 5am UTC in the UK, though that will obviously vary around the world. Wartburgers are advised to check locally on the interwebs. Obviously, there won’t be any point staying up if it’s bucketing with rain. Forecast is mixed hereabouts. Nick Bulbeck: and there is no risk of damaging your eyes. I tried jogging, but I couldn’t keep the ice in my glass. I believe we’re barking up the same hymn-sheet here. Jack: Maybe I need to read the post again but this one kind of missed the mark. Not sure I get the point. I also believe the Bible is the true Word of God. I have no desire to permit or promote abusive, power-hungry religious leaders in the name of Christianity, nor do I subscribe to the superiority of any gender or race or class of people over another. I consider the Golden Rule to be the standard for judging the fruits of true Christian servanthood. Can’t find a place where I fit in that list. I understand social commentary and calling out evil and abuse when one sees them (and clearly, I am supportive of the general purpose and work of this blog,) but I find this list to be derisive. I was young and now am old.I have been a believer for 60+ years.No one has ever successfully wrestled me to the ground and put a brand on me.I made a decision long ago to follow Jesus and be a disciple of His.I won’t look back, let up, slow down, back away, or be still.I won’t give up or shut up until I have prayed up and raised up His Name above all names.I will go until He comes for me and go until He stops me.I don’t know where that puts me in the “5 Types of American Evangelicals”, but I do know that the noise in all of those ranks have divided me out of the equation often.I used to think that I was alone in the wilderness, but found that there are 7,000 other Wartburgers who have not bowed to Baal.Maybe we are the 6th group?! You are literally being the “ekklesia” (Tyndale transcribed this word as ‘congregation’) every day, of which born again believers are called to do, apart from any hierarchal religious system in which “lording it over” occurs in every religious institution. The priesthood of believers only know Jesus Christ as the One and only “Head” and “Mediator” in our faith, which the “leadership teams” of visible evangelicalism truly hate. Want to follow the leading of religious people in your life…… c’hurch leaders and membership will love you. Want to follow the leading of the Holy Spirit in your life…….c’hurch leaders and membership will hate you. In Jesus time and ours as well, an individual MUST be born again and believe in Christ alone for salvation, no Nicolaitan system required. Beth74: I am supportive of the general purpose and work of this blog,) but I find this list to be derisive. I took that to be the main point of this post – to show stupidity of pigeonholing people into caractitures. Christians should hate the Nicolaitan system where an authoritarian pulpit lords over the pew. Why? Because Jesus hates it: “But you have this in your favor: You hate the practices of the Nicolaitans, which I also hate” (Rev. 2:6). Much of what is discussed on TWW is the result of Nicolaitans in the American church … we may call them something else (e.g. New Calvinists), but they are of the Nicolaitan spirit, nonetheless. SiteSeer: And maybe it turns out that the big names and organizations turn out to be nothing and vanish like the wind when their time is up. “Many who are first will be last, and many who are last will be first” (Matthew 19:30). I come from a time when the definition of an evangelical was simple: those who believe in the necessity of being born again, and seek to lead others to being born again through repentance of sin and belief in Jesus Christ as Savior to bring that forgiveness. How in the world did we slip so far people outside the movement do not know what the most basic premise of the movement is? May God forgive us, and may we return to making the main thing the main thing. Not if we are Calvinistic or Arminianistic or Baptistic. Not if we are young earth or old earth, dispensationalist or historic pre mill or amill or post mill. Nope, just plain and simple do we believe in the necessity of new birth and seek to lead people to that new birth? That is it. Max, is it possible God now is calling folks as missionaries TO the SBC? Yes, it’s better to be commended by Jesus, than condemned. Bring this list forward into 21st century church … Wartburgers, which best describes the church you attend? current events, and a reported perspective on the current events. never understood the word ‘evangelical’. always seemed like a trumped-up little word to separate the exclusive in-group from the out-group. well, i’ll happily be the first. beware the soul who dares to classify me. oh, piffle- scratch the last line…. should have been edited out. I read the comments on this thread slightly, or more then slightly confused. It’s like there is great mystical concept called “Evangelical.” We ask ourselves if it’s real or just an undefinable figment of imagination. We don’t act this way with things outside the Faith. If I say Ford Motor Co, nobody questions if FMC is a label to vague, or not applicable to today culture. You either drive a Ford, or you don’t. It’s thing. Evangelical = Neo- Evangelical. But the Neo was soon dropped. It’s a thing. How hard is this? If you are a Christian alive today, you have been affected by a 1940’s internal church war deciding the relationship of Church, and World. The Neo-Evangelicals won. Does no one have Google? Yes we do, but your simplistic definition is severely lacking. Not lacking at all, typos aside. -It was not the same Gospel as described in the Scriptures. -It very much was a reaction to Dispensationalism / Fundametalism. -It is very much also an engagement of culture, for the express purpose of influencing society with Protestant traditions. It is a struggle both within, and without. That is misrepresenting historical events. Individuals unfamiliar with Evangelical history could easily be confused by this idea that historical events might only be personal opinions or view points. Individuals belonging to the North American Church, have been affected by history, whether they know the existence of that history, or not. Harold Ockenga and the origin of the term Neo-Evangelical. Notice below the referances to social influence, including a political influence. linda: Max, is it possible God now is calling folks as missionaries TO the SBC? If so, they are voices crying in the wilderness. The New Calvinist movement has come in like a flood and is now in control of the SBC wheel. It will have to run its course before evangelists can enter SBC pulpits again. Ah, but Max, the Calvinists did not come in through the pulpit and evangelists. They came in through the pew. I knew far more Calvinists in the SBC than I can count long before I heard one in the pulpit. So maybe the SBC needs an invasion of traditionalists. Shoot, to be honest they don’t even need to join where they attend. Be there, comment, live out the faith publicly the other 7 days of the week, refuse to be re-educated comrade. As to the 5 kinds labels, I was thinking today that there may be two: those that view the world and the faith optimistically and those with a negative mindset. The optimist can see the flaws and works to change them without embracing cynicism and negativity. The one with the negative mindset would find fault with Jesus Christ if He stood before them in the flesh, and always see the sky as falling. So I am asking myself which one am I? Nathan Priddis: I read the comments on this thread slightly, or more then slightly confused. It’s like there is great mystical concept called “Evangelical.” We ask ourselves if it’s real or just an undefinable figment of imagination. I am missing your point. Whatever “evangelical” should mean or used to mean, it no longer means that in common usage. It has become an extremely vague term that is now nearly meaningless. Yes, many of us do have the mighty Google. But it’s useful to move beyond the wisdom of Wikipedia into the realms of factual history. Rather than go into all the ins and outs of Evangelicalism, readers might be interested to read about its history (at least in the American form) in the Wheaton College archives. You’ll see that things started moving a long time before Ockenga and that Free Will Baptists played a formative role. And for a complete overview, “Division and Unity: The Paradox of Christianity in America” – the introductory essay to ‘Dictionary of Christianity in America’ is essential reading. I think Wikipedia is about as unscholary as possible, and reflects pop culture. Therefore I chose it. I am suspecting we are on the verge of a post-Evangelical chapter in history. Evangelicalism is now 70 years old. It is a tired corrupt movement, just like Fundamentalism was in 1947-48. That’s sorta the focus material of this blog. The re-occuring headlines that all point to something wrong in the Church. What confuses me is the difficulty in calling a spade, a spade. We have spent our whole lives in a Church, at war with itself, and struggling against society. But vocalizing who, what and where, appears really threatening. Why do they happen? Because Evangelicalism specificly called for denomination leadership struggle. Nothing has changed at all. Except the internet was invented and we complain about it on threads in 2019. Why do they happen, and result in 25% of the government unable to function the third week of January, 2019? Because political and social struggle was explicitly called for in writing, in 1947-48. Did the founders envision the nature of their Movement? No, they where probably as shocked as everyone else that it worked at all. We erroneously state the Gospel is entirely a redemption story. But we are uncomfortable with a struggle and deception narrative that began in Eden, and just passes new chapters in history. This chapter is old and lame. Uh, no. Sorry, Nathan, but I disagree with this point. This is politics of a non religious nature that has fomented a partial shutdown of the U.S. government – not starting a political discussion but not everything that happens revolves around christianity. linda: I knew far more Calvinists in the SBC than I can count long before I heard one in the pulpit. In my 70 years as a Southern Baptist (I’m now a “Done”), I knew several classical Calvinists. While I didn’t agree with their theology, I found them to be civil in their discourse and respectful of other expressions of faith. They weren’t trying to take over the SBC and its majority millions of non-Calvinists. The New Calvinist tribe that has come into the ranks is a totally different beast … it is arrogant, militant and aggressive. The new reformers truly believe they have come into the world for such a time as this to restore the gospel that the rest of Christendom has lost (only Calvinism = gospel to them). Jack: Uh, no.Sorry, Nathan, but I disagree with this point.This is politics of a non religious nature that has fomented a partial shutdown of the U.S. government – not starting a political discussion but not everything that happens revolves around christianity. I would argue this mindset does in fact act as the basis for day to day actions, by those under it’s influence. And said individuals occupy locations along a timeline. Examples would be Machen’s Warriors, the Neo-Evangelical crowd and along the path until we reach today’s Neo- Calvinist or Court Evangelicals. Imagine explaining to 1970’s Shepharding Movement leaders, or Bill Gothard that not everything revolved around Christianity, and they should just relax. Not sure if I am getting your point, but your history lesson is very informative. It supports my theory that the whole shebang was started to manipulate and control people, particularly in regards to p*l*tical and ec*n*mic matters. Which explains why ‘the church’ stopped looking like the Body of Christ out to spread the gospel and started looking like the religious right, out to save democracy. One comment removed due to issues unrelated to this post. Sorry. There have been many brands of christendom over the years with aspirations of a christianised society. That is to say, it didn’t start with the “religious right” in the US. During and after the Industrial Revolution in the UK, you could argue that a “religious left” arose. I use quotation marks because “left” and “right” are extremely low-resolution labels in the same way that “evangelical” and “charismatic” are. Labels are a strange – nay, paradoxical – thing. On the one hand they are necessary, because they mirror the way the human brain imposes patterns and order on an otherwise infinitely complex world, and besides, human beings can’t function alone and need ways of identifying others “like” themselves. On the other hand, they’re useless, because they encourage us to apply stereotypes to unique human individuals, and with the best will in the world, our brains fill in those stereotypes with a lot of fine detail that will probably be inaccurate more often than not. To quote an Alan Garner novel: So the matter rests, though we do not. I meant to add “for instance” – it’s been going a lot longer than that, obviously. I am conpletely convinced we where started by Jesus of Nazareth. Am we are also uncomfortable with our history, scriptures and trajectory. Max–totally agree with you about the new Calvinists! Just, probably due to location, I first encountered them in the pew. THEN when they were a sufficient voting block encountered them in the pulpit. I remain prayerful and hopeful that getting rid of this aberration will also come from the pew. I tend not to get hyper over labels, as my Wesleyan friends consider all who believe in once saved always saved as Calvinists, and my Baptist friends consider Wesleyan folks as crypto Catholics. Me, I am merely a Christian. Been worshipping at two churches, one a reformed leaning but definitely not new Calvinist SBC church and an independent fundamentalist Baptist church. Only now that latter is getting involved with rabid YEC to the point of going cultic, so suppose my last time there was, well, my last time there. For here I will continue that SBC, at least until I know how the UMC shakes out in Feb. But at the SBC nobody has conniption fit if someone brings the “wrong” translation or bats an eye if one gal brings her Joyce Meyer Bible or I bring my C S Lewis one. I call it reformed leaning because it is pretty much a combo of good Lutheran but without the liturgical aspect theologically and holding to OSAS. Which adds up to a church that assumes everyone is potentially “elect” and so evangelizes, and then relaxes once saved into the capable arms of a loving Savior. Very joyful, non Lordship Salvation, reformed in a good way like Emmanuel Enid is reformed in a good way. Nathan Priddis: I would argue this mindset does in fact act as the basis for day to day actions, by those under it’s influence. And said individuals occupy locations along a timeline. Examples would be Machen’s Warriors, the Neo-Evangelical crowd and along the path until we reach today’s Neo- Calvinist or Court Evangelicals. Your assuming that everyone is under the influence of these folks. A lot of us (probably most of us aren’t). I never even heard of anything you are quoting and I was a christian for a long time. Now maybe the implication is that I was not the right kind of christian but I would say the Roman Catholic church or the Greek Orthodox church or even the Southern Baptist Convention may have had (and still have) influence to a greater or lesser extent. I’m not denying what Wikipedia says, I just don’t think the influences you are citing were all that important – never even heard of the shepherding movement or Bill Gothard until I read it here. This is more the “evangelical fringe” than a real influential movement. Not that it didn’t hurt people (a lot of people) but just not a huge influence on charting the course of human history. I pray for a day when we will have nothing but those in church again. Wonder if it’s not just because of Amazon, but because of their theology as well. ishy: Wonder if it’s not just because of Amazon, but because of their theology as well. LifeWay is the publishing house for the Southern Baptist Convention. Besides a network of bookstores across the country, it provides Bible study literature and other resources not only to Southern Baptist churches but other faiths as well. In recent years, traditional (non-Calvinist) Southern Baptists (there are millions of them) have become concerned about SBC’s drift in reformed theology – LifeWay promotes New Calvinist materials. It could be they are avoiding the bookstores for this reason; I certainly have for years – the last time I was in a LifeWay store, I almost tripped over a New Calvinist book display (Piper et al.) just inside the doorway.